I always admired my grandmother’s beautiful embroidery skills, and wondered how she turned that bag of coloured thread into intricate, charming designs. I’ve attempted a few little quasi-embroidery projects in the past (a few little felt Christmas ornaments and some extraordinarily bad embroidered names on stockings don’t really count for much), so when the August edition of There for the Making rolled around, I thought I’d channel my grandmother and try my hand at some simple embroidery. 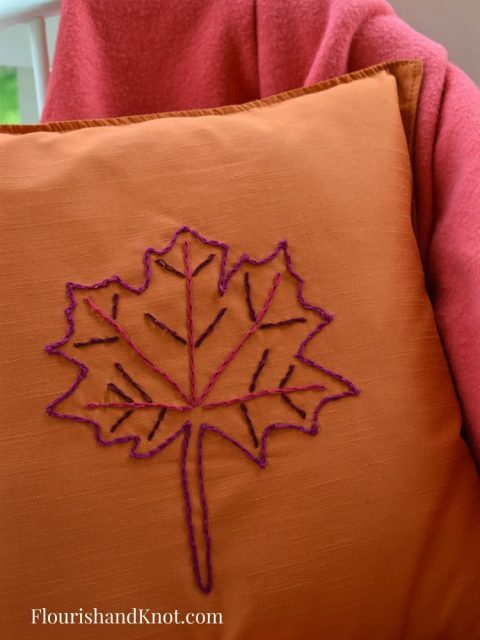 I had an Ikea pillow cover kicking around, so I thought I would add some flair to it with an embroidered design for fall. Everyone loves a good Ikea hack, right?! Well, here’s how I made my easy (single-stitch!) 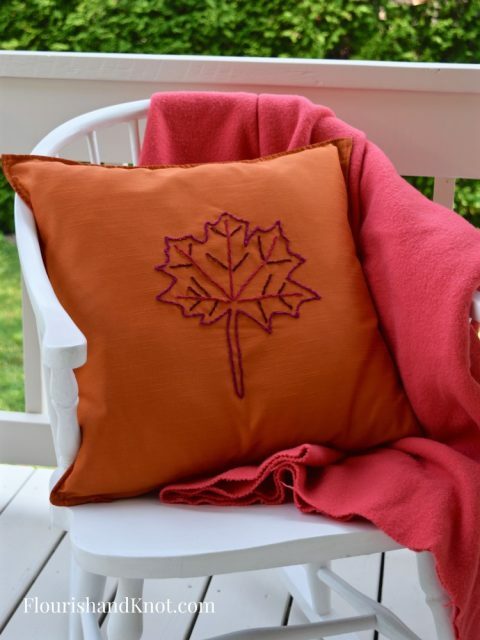 embroidered maple leaf pillow. In case you are new to There for the Making, this is a NO-SPEND, zero-dollar DIY challenge. That’s right: the bloggers who participate need to raid their craft and project stashes in order to repurpose, re-use, or recycle materials into something new. Without spending a cent! I love this project because it really forces us to be frugal, creative, and clever. AND it goes to show that you can do a lot without spending any money! I started out with a plain-jane Ikea pillow cover in a rusty orange faux-silk. I bought these covers a few years ago and still have plans for the other one, but I thought the orange would be a perfect autumnal touch for our living room or deck. 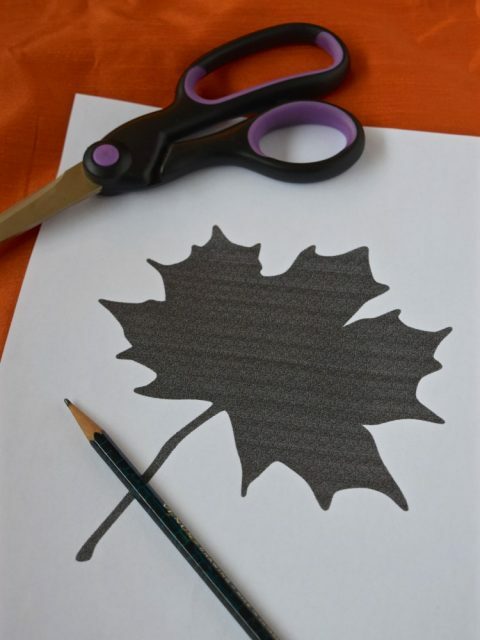 Begin by cutting out and tracing your template onto the centre of your pillow. Trace it lightly with pencil or chalk. You can add your details (like the veins in a leaf, for example) now or later. 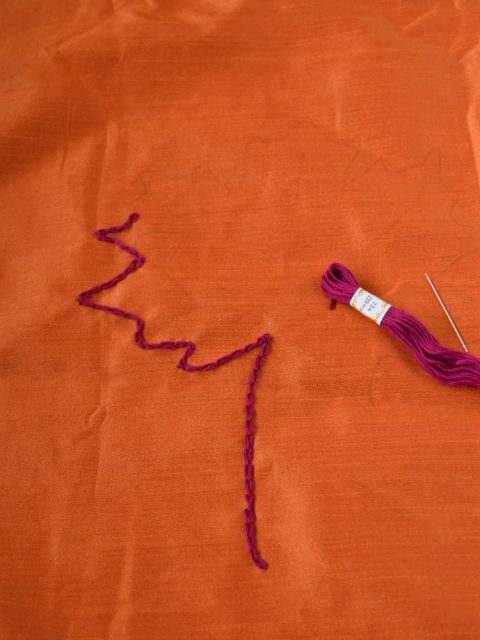 Complete the outline of your design with your chain stitch. 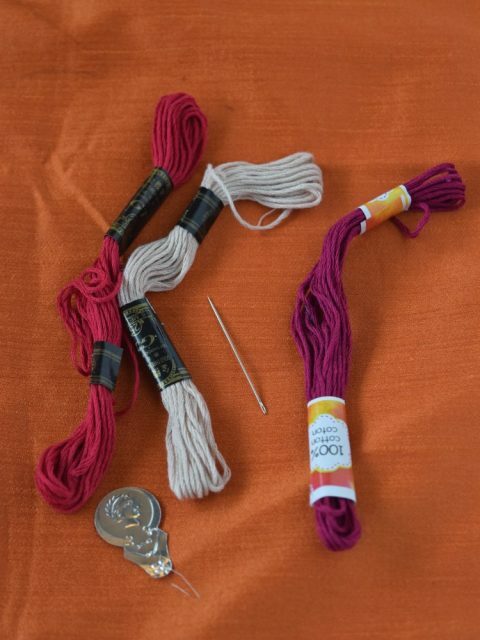 Change colours if desired and create your details using a chain stitch. It can be as fancy or simple as you wish! It really wasn’t a difficult project, nor did it take a long time. Probably about 2 hours, total! And I’m pretty much an embroidery newbie (let’s not journey back to the failed Christmas stocking name tags of 2014), so if I can do it, you definitely can! My stitches are by no means perfect, but I am pretty pleased with how it turned out. Not too shabby! There are three other talented bloggers participating in this August edition of There for the Making, and I would love it if you would take a moment, stop by their blogs, and see what they made on a zero-dollar budget. There is some really creative inspiration to be had this month! Check out all the no-spend DIY inspiration in this month’s #ThereForTheMaking Challenge! It turned out so well! My only attempt at “embroidery” (if I can even call it that) was a felt ornament for my son several years ago. I suppose I should give it another try! Well that’s clever!!! I’m going to try it out! This is great, I’m so impressed with your embroidery skills! Thanks for organizing such a fun challenge! Thanks for your kind words, Meg. I still have a lot to learn, but it’s fun! This is super cute. 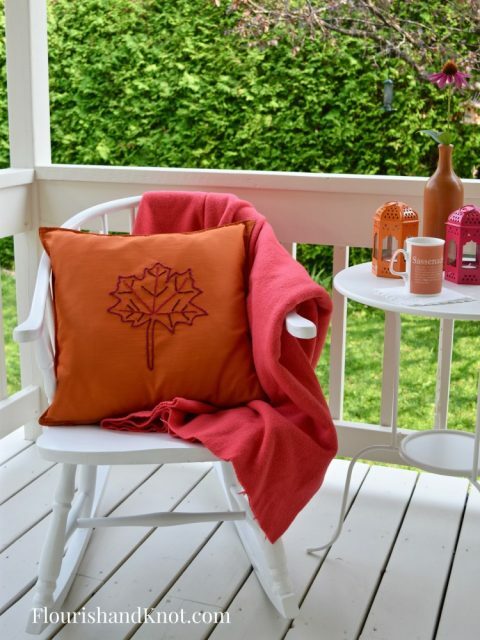 We love embroidery and your pillow is perfect for Fall. Thanks so much for hosting this great tour! Thanks so much! I am looking forward to doing a bit more embroidery this fall. It was so fun!